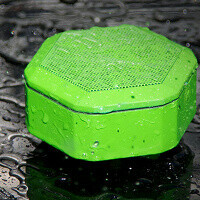 Boombot Rex is an extremely portable, rugged Bluetooth speaker. And it is one of the reasons why we love Kickstarter so much - if it gets enough backers it could make something that did not exist until now a reality. And having an ultraportable wireless speaker for $99 (and you can get it for as cheap as $75 if you back the project now), is something that pretty much everyone who is active can enjoy. What’s even better about the Boombot Rex? You can simply hook it up to your wired (and more capable) sound system and beam music to it wirelessly via the Boombot. It can also be daisy-chained with other Rex’s. The Boombot Rex also works as a speakerphone and with Siri on the iPhone and iPad. This means that with a press of a button you can have Siri speaking to you and you can reply on the speakerphone without having to pull your phone. Hey, it’s not like Hal 9000, that’s always listening but it’s definitely a feature we haven’t seen in many other Bluetooth speakers. Finally, the Boombot Rex fits in your palm and delivers battery life of around six hours. If you back it up quickly, you can still get an ‘early bird’ special for $75, expected to arrive in early 2013. Check it all out at the source link below! Packs everything but the kitchen sink. It looks very nice :D But green and honey cone shape? dont think i can justify spending 99 or even 75 dollars on a speaker this small when i can get a much better one that is not rugged... honestly how many people are "rough" on speakers? ?